Stone fish is a bizarre looking creature, 15-20 inch sized, weighing about 5 pounds, is covered in dark patches and has ugly pimple like things all over its body. It’s found in the coastal regions of the Indian ocean and the Pacific ocean and likes to sit in between coral reefs and stones most of the time. 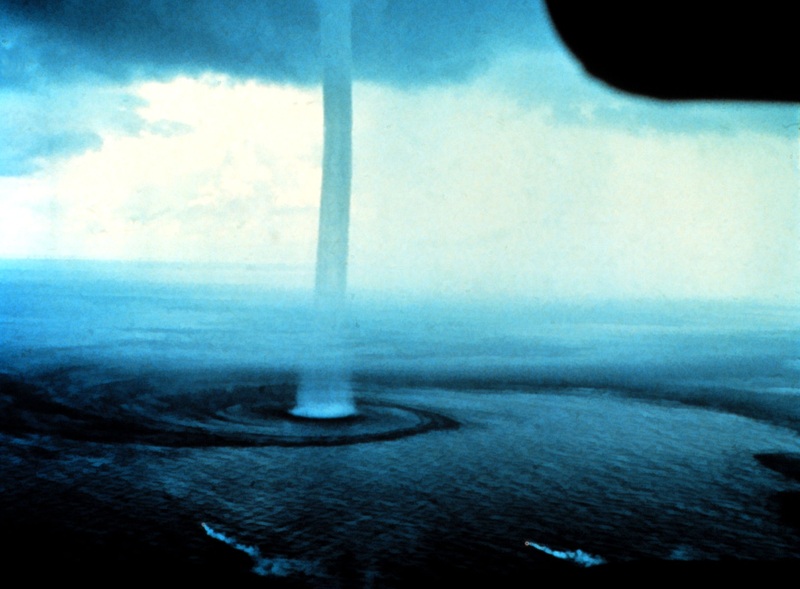 The fish can survive outside of water for a whole day. The fish is well-known as the most venomous fish. The most surprising thing about it is that it can be held in bare hands and you still won’t get poisoned. The logical engineer in me has always paid a lot of attention to how well my money is being put to use, or if something I bought was well worth it. So, before buying anything, I usually love to add in a basic mathematical calculation that would ensure the best logical use of my money. I used to do the same when I was studying engineering and had come up with a handful of tricks, which enabled me to eat the best food, in best quantities at the lowest prices. Till date, I had relied on calculations for individual joints to buy the pizza that gave me the best value for money (irrespective of what my stomach could fit). In other words, I had never used statistical methods, as I always went to only 2 or 3 pizza places and never felt a need to do it statistically. So yesterday, while skimming through blogs on NPR, I came across a post by Quoctrun Bui, where he had calculated the best valued pizza size using statistical methods. The final findings of his study based on 74,476 prices from 3,678 pizza places were condensed into a graph which depicted data as follows (here is the link to the article for an interactive version of the graph). 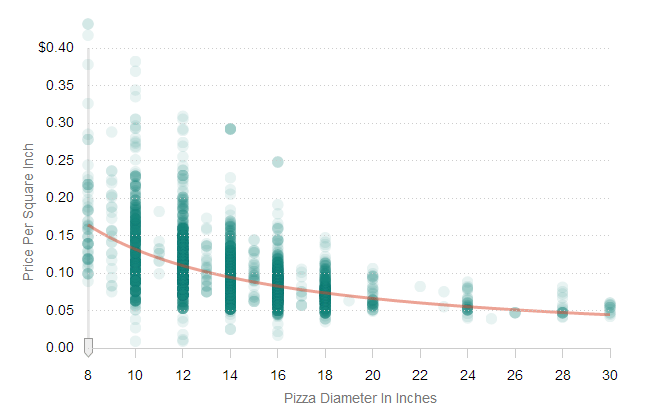 The above graph plots 74,476 data points to find the pizza size that gives you the best value for money. The y-axis plots price-per-square-inch – the lesser price-per-square-inch you pay, the better deal you score. This basically means that buying the largest pizza gets the most value out of your money. As the size increases the value for money increases or the price you pay per-square-inch of pizza decreases. – Statistically speaking. I did not pay much attention. Please point if there is a mistake. No, always buying the large pizza clearly is not the best option at Dominos in India. A small pizza is the best option (economically) if you are buying from the categories: Simply veg, Veg I or Simply Non-veg. Never go for the small Non-veg II pizza. It is the worst choice you can make. Never ever get a medium pizza from any category! I’d love to see someone doing the same thing for other popular pizza joints. Do get back to me if you have done it. I’ll add it to the article as an update. Alonzo Church quote on foundations of mathematics, logic and programming languages. Is there a tool that will optimize mathematical formulas?